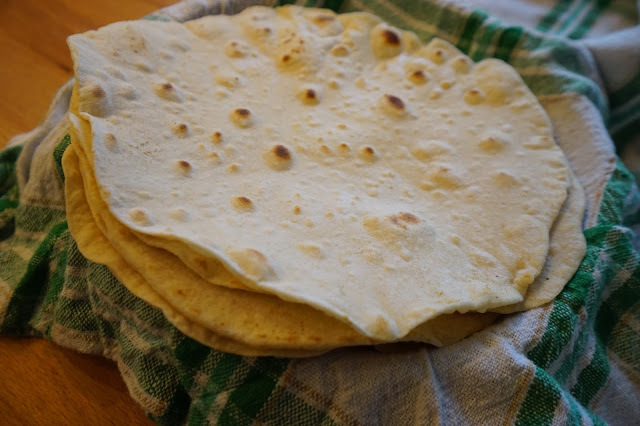 Making flour tortillas from scratch is pretty quick and easy. 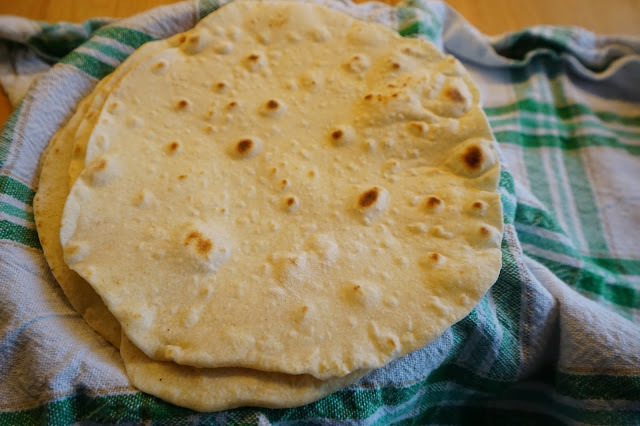 In Denmark, you can only find some pre-made tortillas that taste really dry, and bland, so much so that they will ruin any meal you use them with. So what does that mean? I gotta make tortillas from scratch if I want them to be good. :o) The hard part can be rolling them out, and cooking them, but once you get the hang of it, it’s pretty easy in the end. Here is a video on how I make homemade tortillas, and below is the recipe. Mix the flour, salt, and baking powder in a medium bowl. Add the coconut oil or oil of your choice, and mix it together with your fingers, until kind of resembling bread crumbs. Add warm water, and mix together with a spoon or fork until a dough forms. Knead the dough on a lightly floured surface for a minute or less until it becomes smooth. Then, divide the dough into equal portions, and cover with plastic wrap and a towel. Let the balls of dough rest for about 10 minutes. Meanwhile, after 5 minutes, set a pan on the stove and let it heat up. I usually have it on a medium/high setting. It's important that the pan is hot enough when you start to cook the tortillas. Roll a tortilla on a lightly floured surface. I usually press it down, and then roll it. You can roll it to the thickness you want. Place the tortilla in the hot pan and cook it for a minute or two on each side. It is a good sign if it puffs up. Sometimes the first tortilla doesn't come out well, if the pan is not hot enough. Make sure to watch the tortilla closely and flip it over when it starts to brown. Repeat this process until all tortillas have been made.